Maurice Sendak's book In The Night Kitchen was one of my earliest cooking inspirations. In my mother and grandmother's kitchens, flour and milk could be made into a hundred wonderful things, and there was always something new to try. The book confirmed it — baking was magic. The night kitchen Maurice Sendak drew stuck with me. It was another world — mysterious, a little dangerous, and filled with strange characters — which is exactly how I found the kitchen when I first started cooking professionally. "I'm not the milk, and the milk's not me," shouted Mickey before he built his dough airplane and flew into the sky to fetch milk for the cake. Maurice Sendak sparked the idea that creation and adventure lies within every raw ingredient and every blank page. Every day I sit down to write or open my cabinets looking for something to play with, I find again how true that it. To quote another of his books, "Let the wild rumpus start!" We've taken our cephalopod spotting obsession onto Pinterest, and our collection is growing all the time. We've written about the great possibilities for value-added dairy products. 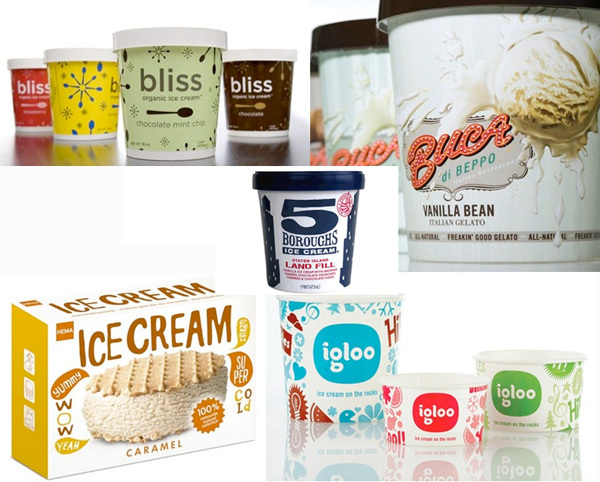 Farmers and pastry chefs — as you turn your thoughts to summer product launches, get inspired by the best collection of ice cream packaging I've ever seen in one place. As we get ready to go to the International Boston Seafood Show, we have one of our favorite ocean dwellers on the brain — cephalopods. Everywhere we look, they're sticking their tentacles into the culture, from design to dinner. Grilled octopus with garlic, kale, goat cheese & apples from Worth Kitch from SkeeterNYC. Wrapped around Darwin in London by the graffiti knitters of Knit the City. In the inky embrace of a leather chair by Máximo Riera allow you to become one with an octopus. Stenciled on the street in San Francisco. Tentacle fashion as a scarf on Etsy. Get in touch with your inner cephalopod with wearable finger tentacles.